The World Food Programme (WFP) is the food assistance branch of the United Nations (UN). George McGovern, first director of the US Food for Peace Program, proposed the creation of WFP to the UN's Food and Agriculture Organization (FAO) in 1961. WFP was formally established in 1963 by FAO and the United Nations General Assembly. Today, WFP is the world's largest humanitarian organization fighting hunger worldwide. Its primary mission is providing food to those who are unable to obtain it for themselves. On average, WFP delivers food to more than 90 million people per year, 58 million of whom are children. In addition to food security, WFP works to reduce child mortality, improve maternal health, and combat disease. 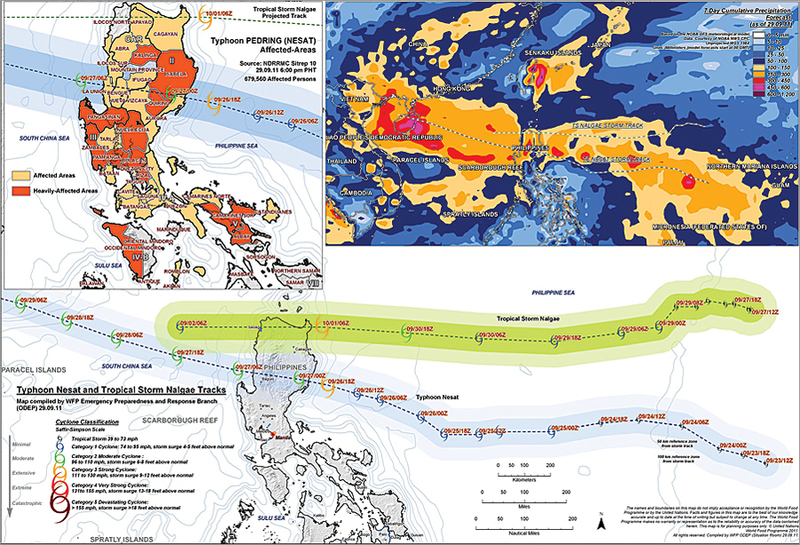 The organization's Operation Department of Emergency Preparedness (ODEP) actively supports various emergency relief efforts around the world with GIS analysis. 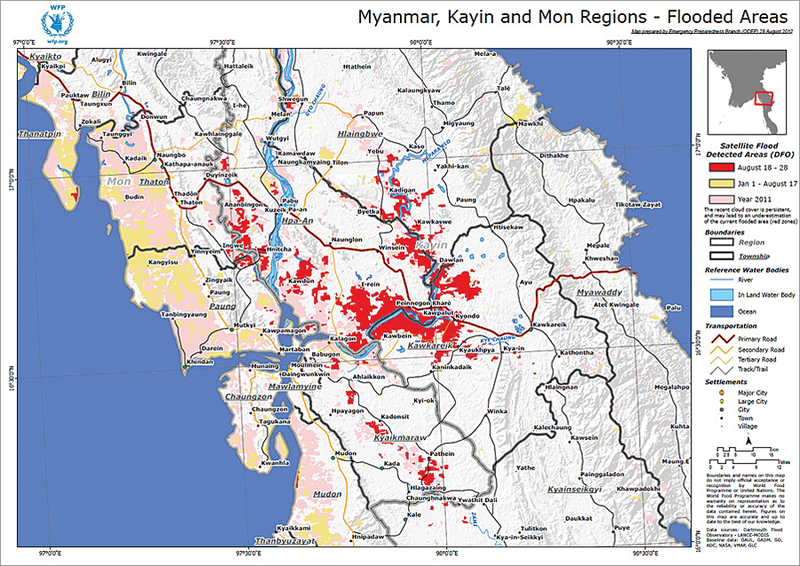 To facilitate this work, it has developed a methodology using GIS to understand the higher vulnerabilities among populations living in areas prone to natural disasters. This analysis considers factors such as environmental degradation, food insecurity, malnutrition, and the historical occurrences of natural hazards. Satellite images are analyzed to identify poor growing seasons and years of low crop productions. The analyses help WFP quickly develop intervention strategies when disaster strikes. 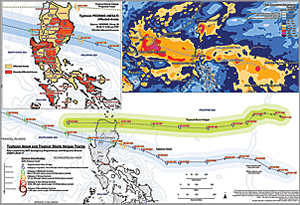 "GIS is used extensively in the prevention step of the disaster cycle," says Amparore. "Prevention includes the evaluation of man-made features, such as dams and levees, to make sure they can withstand rising floodwater, as well as determining the structural integrity of buildings, the reseeding of hillsides after deforestation to reduce mudslides, the evaluation of building codes and land-use zones to make sure they meet current safety standards, instigating community awareness campaigns to help residents better prepare themselves in the event of a disaster, and so on. Using GIS throughout this step provides management tools for project planning, review, and implementation." Preparedness includes risk identification and assessment; the development and maintenance of emergency communication services; stockpiling essential food supplies, water, and medicine; and the establishment of evacuation routes. 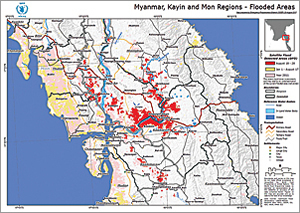 "GIS is used here in the evaluation and categorization of potential risks, as well as determining the optimum locations for emergency food stockpiles, the development of evacuation plans, and determining the optimum routes for refugees if it becomes necessary for them to evacuate," says Amparore. The recovery step includes the provision of temporary relief, such as food and shelter for disaster victims, as well as damage assessment, repair, and reconstruction. "GIS is ideal for logistics management and is used to determine where resources are needed so that recovery efforts can be prioritized," says Amparore. "It is also used to specify where distribution stations should be positioned; evaluate the condition of existing humanitarian corridors; and establish the location of refugee camps, emergency supply depots, and relief worker staging areas." 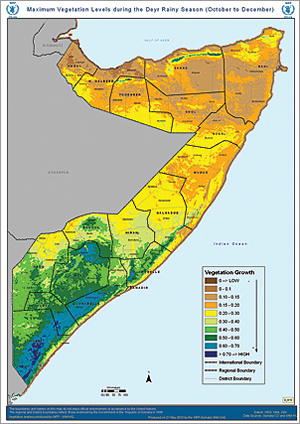 For example, WFP's Vulnerability Analysis and Mapping unit recently created the Spatial Information Environment in an effort to increase access to original and derived spatial information within WFP and its partners. In addition, it is working with FAO to develop an ISO-standard metadata clearinghouse to enable greater compatibility and promote the sharing of spatial data between agencies. "Standardization is the key to the continued growth of GIS at WFP," concludes Amparore. "This will allow us to expand our analytical capabilities and adopt an even greater scientific approach to data analysis. I also think the involvement of local universities, when possible, would help facilitate our work and provide the host country with a greater sense of involvement in our relief efforts."